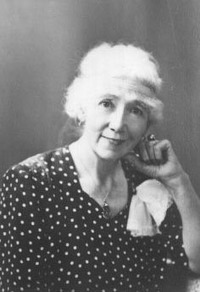 Minerva Bernetta Kohlhepp Teichert was an American painter notable for her art depicting Western and Mormon subjects, including a collection of murals depicting scenes from the Book of Mormon. Minerva Teichert was born on August 28, 1888, in North Ogden, Utah, and grew up on a ranch in Idaho as the second of nine children. Her father, Frederick John Kohlhepp, was a cultured gentleman who gave up the prosperity of his Boston family to go west in search of adventure. When he found Mary Ella Hickman and the restored gospel, he embraced both. Life on the homestead near Pocatello, Idaho was rich food for Minerva’s taste for drama and romance. Each night her father gathered the children around to read the scriptures or classics of literature. “My parents were dreamers,” she later recalled. “Oh, the fairyland we lived in” (“Miss Kohlhepp’s Own Story,” Pocatello, Idaho, 1917). Minerva left home for the first time at age fourteen to work as a nursemaid for a wealthy Idaho family in San Francisco. There she saw museum art for the first time and attended classes at Mark Hopkins Art School. But it was not until she had graduated from high school back home and taught school for several years that she was able to pursue any serious training in art. By age nineteen, she had scraped together enough money to go to Chicago, where she studied at the Chicago Art Institute under the great draftsman John Vanderpoel, a master of the academic school of painting. Several times during her three-year course she had to go home to earn more money in the fields or in the classroom. But always she returned to follow her dream. With characteristic confidence, Minerva once confronted Mr. Vanderpoel, asking why he criticized her work so harshly when so many classmates were doing much poorer work. She later recalled, “I shall never forget the disappointment on the dear little man’s face when he answered in a choked voice, ‘Miss Idaho, can it be possible you do not understand; they’re not worth it, they will drop out, but you—ah, there is no end’ ” (“Miss Kohlhepp’s Own Story”). She married Herman Teichert who was not a member of the Church. Herman was a gentle cowboy whose favorite sport was chasing wild horses on the desert by moonlight. In April 1915, however, she left Herman behind, telling him to marry someone else, and went to the Art Students’ League in New York City. At the time, the League was one of the most important art centers in the world, the great European academies having waned in influence and American art having begun a period of vitalization. Minerva paid for the privilege of studying there in a variety of ways, including sketching cadavers for medical schools and performing rope tricks and Indian dances. Minerva’s trademark headband, which she jokingly said she wore to “hold in her brains,” was a reminder of her colorful employment as an Indian dancer in New York. After a spiritual experience that impressed upon her the desirability of family life over gold, Minerva determined to return to her husband. Robert Henri asked her, shortly before she left New York, whether any artist had ever told the “great Mormon story.” Minerva responded that no one had yet done it justice. Henri commissioned her to be the one to do it. Minerva suffered from a grave illness while Herman was off fighting during World War I, and promised the Lord to be even more committed to doing His work. Her hair greyed during this illness and became for her the symbol of her commitment. When Herman returned, the family moved, and they eventually raised five children on a ranch in Cokeville, Wyoming. Minerva continuously painted, even with the burden of child care and working the ranch. In fact, she was driven to paint and could not be happy without that creative outlet. In the early years of her marriage, money for paint was scarce. Often Minerva painted and sketched on masonite, scraps of wood, even brown paper. Although she valued her gift, she never overvalued her individual paintings. One of her sons rescued a Minerva Teichert self-portrait on a board she had been using when she chopped off chicken’s heads. Minerva painted mostly in a cramped room with poor light, sometimes having to fold the murals she was working on. She painted scenes from western Americana, and religious artwork expressing her deeply held religious convictions. After her marriage, she was isolated from the "world of art and artists," and she developed a distinctive style, easily recognized. She had a particular love for painting animals. “The movement she captured in horses and cattle is magnificent,” comments Nancy Webb, a writer who recently reviewed the museum exhibit for Southwest Art and whose article on Minerva Teichert appeared in the March 1989 issue. Teichert was an independent, opinionated woman who stood up for Women's Rights and was an outspoken political conservative (Wikipedia.org). She was also, however, known for her charity. She constantly offered service to others, and took people in need into her home. Many Cokeville neighbors—children and adults—got their first art lessons in the Teichert living room. Those who showed promise were often recruited to paint backgrounds for Minerva. Many others served as models for her paintings. Minerva’s spiritual life was guided by dreams and by an increasing ability to rely on the Lord. As a young mother, she turned down an opportunity to study in London with her great teacher Robert Henri when she dreamed of a daughter who would soon be born to her. Minerva saw future daughters-in-law in dreams before she met them. She trusted implicitly what she felt the Lord had told her and taught her children and grandchildren to rely on his guidance. One of the highlights of her spiritual life was the baptism of Herman in 1933. Later that year they were sealed in the Logan Utah Temple. By her death in 1976 at the age of eighty-seven, Minerva Kohlhepp Teichert had created perhaps as many as a thousand pieces of art. Teichert is known for a set of 42 murals from the Book of Mormon, as well as her murals inside the Manti Utah Temple. 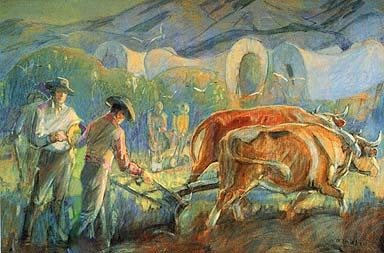 Several of her paintings are on display in various buildings of the Brigham Young University campus. 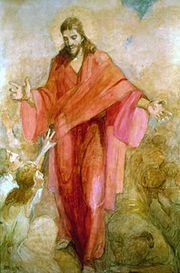 Teichert's distinctive style can be seen in the painting Christ in a Red Robe, in which women can be seen reaching out to Christ, who is depicted in a red robe at his second coming, referencing Isaiah 63:2. The colors are mostly subdued, except for the central figure who is brightly illustrated (Wikipedia.org). This page was last edited on 30 June 2018, at 16:56.